Sun., Dec. 4, 2016, 2:24 p.m.
VIENNA – Left-leaning Alexander Van der Bellen and his message of moderation and tolerance prevailed in Austria’s presidential election Sunday, with preliminary results showing him with an unbeatable margin over right-wing rival Norbert Hofer. Austria’s president has mostly symbolic duties. But with Sunday’s election coming after Donald Trump’s win in the United States and the Brexit vote in Britain, the vote was being watched across Europe as an indication of how well right-wing euroskeptic figures would do next year in elections in other EU nations. The result was greeted with relief and congratulations by mainstream politicians in Austria and neighboring Germany. Austrian Chancellor Christian Kern said Van der Bellen “will represent Austria domestically and abroad in an excellent manner” – alluding to fears by establishment politicians in Austria that a victory by Hofer, whose anti-immigrant Freedom Party is critical of the European Union, would hurt Austria’s image. Van der Bellen is pro-European Union and represents liberal to left-of-center views. Right-wingers allied with Hofer, meanwhile, praised the losing candidate for a strong electoral fight despite his defeat. With nearly all results counted, Van der Bellen had 53.3 percent of the vote to Hofer’s 46.7 percent. While the margin may change slightly when final results are in, Austrian officials said the results gave Van der Bellen an unbeatable lead. 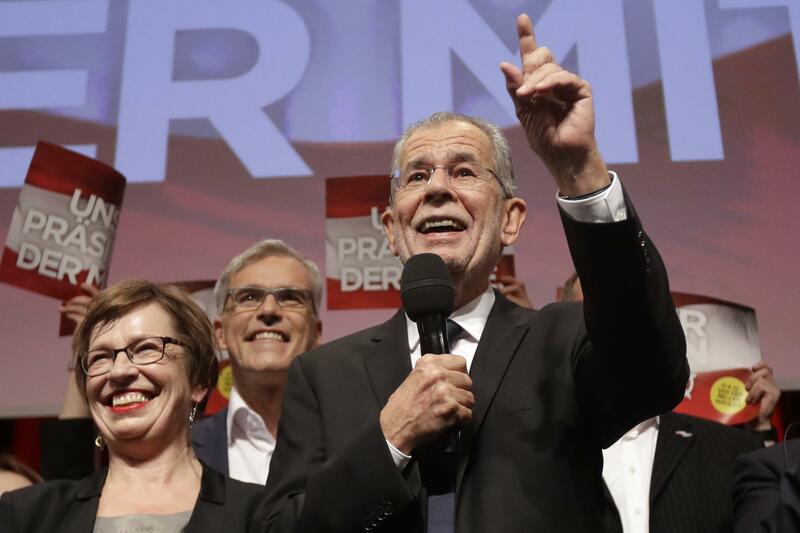 Noting the outsize attention the election in Austria was receiving, Van der Bellen declared that “what happens here today has relevance for all of Europe” as he cast his ballot. He said he would work to unite a country deeply split between the moderate liberals who voted for him and supporters of Hofer’s anti-immigrant party. Hofer conceded his loss in a Facebook posting. Acknowledging that he was “endlessly sad,” Hofer said. “I would have been happy to take care of our Austria.” He urged voters of both camps to bury their differences and work together. Final results will not be available until more than 500,000 absentee ballots are counted Monday. Far-right National Front leader Marine Le Pen of France and anti-immigrant politician Geert Wilders in the Netherlands, who both face national elections next year, tweeted their support Sunday for Hofer as voting took place. After he lost, they congratulated him on his strong showing. Traditional political figures in Germany put aside their differences to welcome Van der Bellen’s victory. The election was a rerun of a vote in May that Van der Bellen narrowly won. Austria’s Constitutional Court ordered a repeat following a court ruling after Hofer’s Freedom Party claimed widespread irregularities. Published: Dec. 4, 2016, 2:24 p.m.